The Suwanee dental office of Dr. Jay Rosenheck provides high-quality dental care for Johns Creek and the surrounding areas. Our entire team is dedicated to making your visits with our dentist positive and productive. Dr. Rosenheck offers care that is safe and effective. In addition to treatments that protect lasting dental health and wellness, our treatments are completely mercury-free. None of our restorations include this potentially harmful element that is commonly found in conventional dental restorations. Our approach to treatment is ideal for children and adults alike. 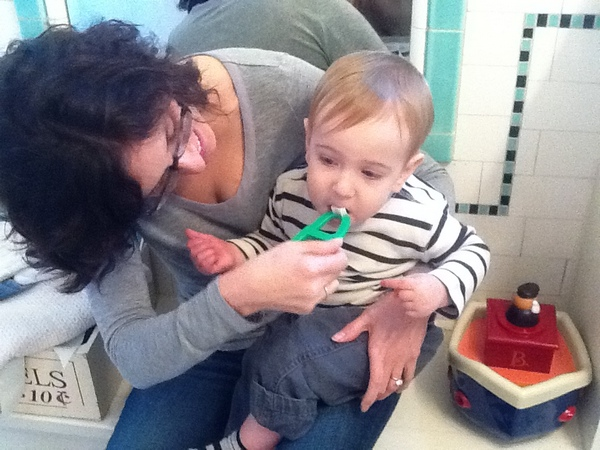 It's never too early to start brushing! Dr. Rosenheck values your time and our staff offers flexible appointment times that maximize your time in our dental chair. We also don’t overbook so you’ll never be kept waiting long. Our dentist and staff take the time necessary to discuss all aspects of your dental condition, treatment options, cost, and how best to meet your specific needs. The reception area of our relaxing, boutique Suwanee dental office transitions into a state-of-the-art dental facility that is equipped with advanced technology that helps us deliver comprehensive dental care for our patients. We use our advanced technology and techniques to maintain and restore both the function and beauty of your smile. There can be no perfect smile without a foundation of wellness to support your oral health and even if you are free of tooth decay, problems with your bite can lead to teeth-grinding, muscle strain, and painful symptoms of TMJ disorder (TMD). Because of the complications they can cause, we treat bite issues proactively. Patients can receive complete diagnostic services for TMD at our Suwanee dental office with our T-Scan computer program. In addition to a thorough exam, this technology assists Dr. Rosenheck by determining the symmetry of your jaw and identifying specific issues that are contributing to your symptoms. If you’re looking for a dentist near you in John’s Creek, Sugar Hill, or Buford, be sure to visit our “Locations We Serve” page for driving directions and additional information on how to find our Suwannee dental office. To learn more about our dentist and available services, call our office today!